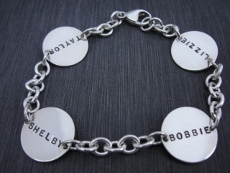 Bracelets begin with a custom sterling silver disc hand stamped with the name or affirmation of your choice. The sterling silver chain bracelets come in 7", 7 1/2" (standard) and 8" long, but we can customize the length to fit your needs. If your bracelet has one or two charms, we attach them together at the clasp. 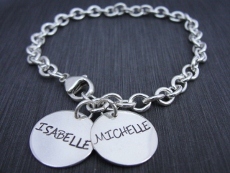 If your bracelet has three or more charms, we space them out evenly over the length of the bracelet. Link bracelets can have a max of 5 discs only.